In Steven Spielberg's splendid horse opera War Horse, everyone (who isn't an evil German) War Horse meets falls in love with him. How can you not? War Horse is a wonderful war horse. 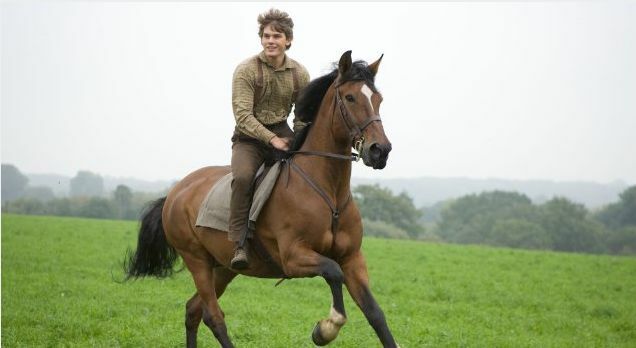 Literally born into the movie, War Horse is named "Joey" by his first owner, good-hearted farm boy Jeremy Irvine. When Irvine's alcoholic war hero father Peter Mullan sells Joey to British army leftenant Tom Hiddleston (Loki from Thor and The Avengers) in order to pay off his debt to his seedy landlord David Thewlis, Joey's relatively idyllic life as a plow horse and galloping around the verdant hills of merry olde England ends and his troubles begin. Indoctrinated as a mounted steed for service in World War I, Joey is transformed into War Horse (and even named such - Joey is actually more "War Horse" than William Wallace was "Braveheart"), surviving a disastrous charge at the German army by Hiddleston and his battalion. Soon, War Horse escapes with two doomed young German deserters and finds himself under the care of a charming but sickly young French girl, Celine Buckens, and her kindly grandfather Niels Arestrup. Alas, the Germans come calling and take ownership of War Horse once more, turning him into a beast of burden until he frantically escapes and gets himself tangled in the barbed wire of the no man's land between the British and German encampments. This Passion of the War Horse is among the very best film sequences of the year, as a compassionate British and German soldier from each side agree to a temporary, respectful detente so they can use wire cutters to free War Horse from his predicament. War Horse contains a lot of horse play, rough housing, and even horse housing. Though he indulges in a curious penchant for getting reaction shots, complete with hints of a smile, from War Horse, Spielberg is at the peak of his epic filmmaking powers. War Horse endures the brutality man heaps upon man first hand but embodies the determination of the equine spirit. And the human spirit too, one supposes. When War Horse is finally reunited with Irvine, who joined the war never dreaming he'd see Joey again, it's a touching reward for a brutal, nerve racking few years of war one wouldn't wish on any man or horse. I love you, War Horse!